install software and create backup discs etc conveniently? Vansky CD External Driver is the ideal solution for you. Vansky External CD drive come with a USB 3.0 data cable and an additional power supply cable. The portable CD player can be used without the power supply cable connected, but it would be more stable with both cable connected. The external DVD drive for laptop come with unique appearance and touch control design, makes it much more attractive than the traditional ones. There is an emergency eject hole. No worry if some unhappy trouble comes, the emergency eject hole will help you deal with it. With only the USB cable it can also work. But when the indicator light turn red or you feel the speed is slow, you need to connect the power cable. USB 3.0 Interface -- Vansky External CD Drive come with standard USB 3.0 Data Line Interface which provide with 24X faster data transfer rates and Power Interface which can supply power to get rid of the trouble of shortage power. It is backwards compatible with USB 2.0 and USB 1.0. Deluxe Diamond Appearance -- Smooth convex diamond surface and simple modern design, fashionable and scratch-proof exterior. Pop-up with Touch Control Design makes it cool and easy to get CD or DVD in and out. Vansky external CD DVD drive is slim, lightweight, compact and portable. Easy To Use -- Plug and play. No external driver required. 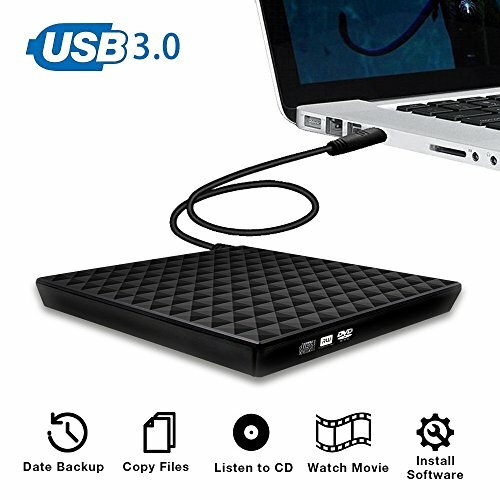 USB 3.0 External DVD Drive is a perfect companion for computers without the internal drive. You can burn files, install software and create a backup CD/disk..
High Speed -- Adopted unique intelligent burning technology, this external cd burner CD-RW combo drive support DVD-ROM,DVD-R,DVD+R,DVD-RW,DVD-R DL,CDA,CD-ROM,CD-R,VCD,SVCD,CD-RW. Max DVD read speed 8X; Max CD read speed 24X and max CD burn speed 24X. Universal Compatibility & Five Stars Warranty-- The external CD drive is ideal for various devices. It supports Windows 10/ 8/ 7/ XP/ Vista and all version Mac OS system. You can use it for Laptop, Notebook, PC and Desktop Computer. 45 Days Money Back. One Year Guarantee.